My story: I’m new to woodworking (literally just a couple weeks in). I’ve read a couple of books and now am starting to purchase tools. I’ve heard to compile tools as you need them for the projects you’re working on. My current project calls for some brad nails. I know I could get away cheaper but this seems like a hell of a deal. Your guys’ thoughts? If they are in working order, that is a good deal. I paid $99 for my Rigid brad nailer. I use that nail gun more than my stapler and pin nailer. Just ask how much the owner oiled the nailers. Typically you put a few drops of oil before every daily use. If they did not do that, then you could have some problems. The 16ga nailer is very rarely used in my shop, but I have one, anyway. $50 is a good deal as said above they were low use and well oiled. 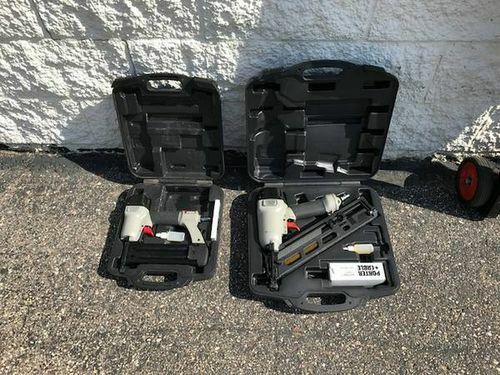 With the look of the boxes I’d say you’re pretty safe they don’t look like they spent time on a jobsite, I probably shoot 500 brads to a single 16 ga in my work, maybe $25 for the brad if they’ll break them up. That’s said of course assuming you’ve got a compressor, otherwise most all of the compressors have nailer packages out there and you could do as well with the compressor nailer combo & have a new nailer. no-frills nailers but they get the job done. I’d say it’s a bargain. +1 on ChefHDAN’s comments. The finish nailer is more of a carpentry item for installing trim around windows, doors and baseboards. I still get plenty of use out of mine though doing stuff around the house. My brad nailer was my go-to nailer in the shop for years, but since I got a 23 ga pin nailer, I rarely pull it out. That said, for $50, I’d go for it. They are good to have around. It’d be nice if you could hook them up to make sure they work and the seals don’t leak. My PC 18 Awg brad nailer is my go to nailer in the shop. It’s been around my shop forever it seems (more than a decade). I can’t see much downside to either of these, except if they aren’t in your future shop/woodworking plans. They look perfect for trim carpentry work. As has been stated that finish nailer is more of a trim gun than anything else. FWIW, that sure looks identical to my 15 gauge PC nailer and not the 16 gauge. You could probably resell that 15 gauge for $50 if you so choose but I wouldn’t do it. I use Porter Cable 16 and 18 Gauge brad nailers and the framing nailer as well. They have always worked well for me and I have used them heavily for many years. I would advise that you do not buy the Porter Cable “pancake” compressor to go with them as it is incredibly loud for such a small unit. I would look into a brand called California Air Tools, which is a popular and very quiet compressor. There are other quiet brands as well but I can’t remember them at the moment. Thanks for all the info. I pulled the trigger and picked them up (Craigslist find). They are a 15 and 18 gauge. Look to be in great condition. Guy said he purchased them 15 (?) years ago and never took to woodworking like he thought he would. (Just sold a table saw that I misssd out on too.) im on the other side of the equation and hope it works out differently. I’ve been obsessed for 3 weeks now reading everything I can get my hands on! Will be making my first project, a chalkboard and key holder in the next week or two. Thanks again for all the advice. I obviously came to the right place! You Tube probably has one or more videos on just about anything you can dream up. When you get hung up, search You Tube. And then learn how to use Sketchup! and for Sketchup – Rob Cameron’s Sketchup for Woodworkers. The older PC nailers used good quality components. Mine (16 and 18 ga.) are about 16 yrs. old, and were made in the Jackson, TN plant. Newer one have a bunch of plastic in ‘em. I’ll keep rebuilding mine as long as parts supply holds out. I have that same pc pin nailer and it works great. Wouldnt hesitate to get another one. and for Sketchup – Rob Cameron s Sketchup for Woodworkers.